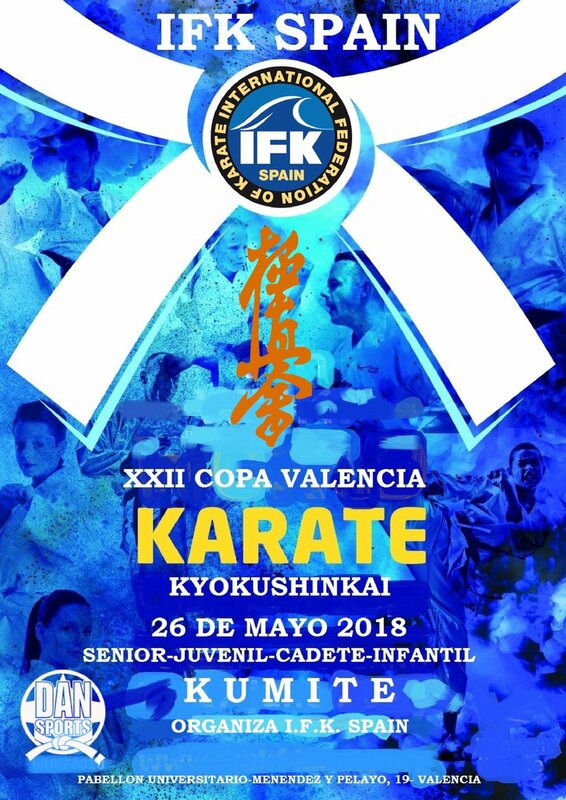 International Federation of Karate Spain hereby has the pleasure to invite fighters from your Country to XXII OPEN INTERNATIONAL VALENCIAN CUP, held on MAY 26 2018 in Valencia-Spain. Insurance and IFK membership card. Senior Men: shin and instep pad, box are obligatory. Gum shield is optional. Senior Women: Shin and instep pad, chest protector and official hand mitts. Middleweights de -70 to 80 Kg. Light - Heavyweights -55 to 60 Kg. The duration of the bouts up to and including semi-finals is FOUR MINUTES (real time) with an obligatory decision being made by the judges. The finals will be four minutes with a possible ENCHOSEN of 2 minutes. The rules will be that of the IFK. The duration of the bouts up to and including semi-finals is THREE MINUTES(real time) with an obligatory decision being made by the judges. The finals will be three minutes with a possible ENCHOSEN of 1 minute. Hitting to the head, neck or face, with hand, fist or any part of the arm. Senior male: Groin box OBLIGATORY. Gum shield and shin-instep pad OPTIONAL. Senior female: Chest protector OBLIGATORY. Gum shield and shin-instep pad OPTIONAL. Hand mitts, shin-instep pads, groin box and head guard OBLIGATORY. Gum shield OPTIONAL. Hand mitts, shin-in-step pads, head guard and chest protector OBLIGATORY. Gum shield OPTIONAL. · THE BEST WAY IS VIA TAXI. IT IS 15 MIN. APPROX AND IT WILL COST 20 EUROS APPROX. · The price of Hotel.